All Morning Harvest Eggs come from one of our family farms that are all 100% New Zealand owned and operated. We supply our eggs to supermarkets, manufacturers, restaurants and cafes all over the country – so you can be assured the quality of our eggs is second to none. Morning Harvest Colony Laid or Cage Eggs. Our new range of eggs are now available in selected stores. Morning Harvest Colony Laid Eggs are packed full of nutrients and goodness so make an excellent choice for keeping a healthy balanced diet. With our local network of family run, New Zealand farms, our chooks produce enough eggs of all sizes, to supply them fresh nationwide. Morning Harvest Colony Laid Eggs are available at all leading supermarkets and are also available in 20 and 30 trays. Morning Harvest Cage Eggs are an excellent source of protein and are packed full of nutrients. Protein is an important part of our diet and a building block for our body’s cells, muscles, tissues and organs. Our Cage Eggs are a quick, easy and affordable way to provide good nutrition to your family. Under the Animal Welfare (Layer Hens) Code of Welfare 2005, Cage eggs will be phased out of New Zealand farms by 2022. We’re working hard now to change the housing for our hens so you’ll see Colony Laid Eggs from Morning Harvest more often in your local supermarket. Morning Harvest Cage Eggs are available at all leading supermarkets and are also available in 20 and 30 trays. To find out exactly where to find our yummy eggs near you, please contact us here. 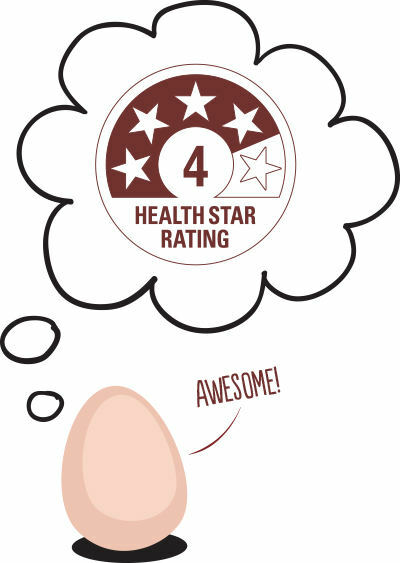 We’ve put the new Health Star Rating system on our packs to help you to make more informed choices about what you’re eating. Eggs are healthy and so our scrummy Morning Harvest Eggs have been given a rating of 4 out of 5, making us a very good nutritional choice. Our eggs are packed with lots of essential vitamins and minerals to help you to stay healthy. Importantly, Morning Harvest Eggs are naturally rich in protein and Omega-3. Each of our farms operates under a registered 'Risk Management Programme' (RMP), which is audited on a regular basis by independent auditors reporting to the NZ Food Safety Authority. This ensures every aspect of every farm complies with the standards set for the egg industry by law (under the Animal Products Act 1999) and ultimately ensures Morning Harvest Eggs are of the highest possible quality. Each farm also operates to the Animal Welfare (Layer Hens) Code of Welfare 2012.